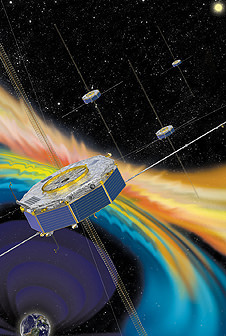 NASA GODDARD SPACE FLIGHT CENTER, MD – NASA’s upcoming Magnetospheric Multiscale (MMS) mission is comprised of a quartet of identically instrumented observatories aimed at providing the first three-dimensional views of a fundamental process in nature known as magnetic reconnection. They were unveiled to greet NASA Administrator Charles Bolden on Monday, May 12, in a rare fully stacked arrangement inside the Goddard cleanroom. Universe Today was on hand with NASA Administrator Bolden, Science Mission Chief John Grunsfeld and the MMS mission team at Goddard for a first hand inspection and up close look at the 20 foot tall, four spacecraft stacked configuration in the cleanroom and for briefings about the projects fundamental science goals. “I’m visiting with the MMS team today to find out the status of this mission scheduled to fly early in 2015. It’s one of many projects here at Goddard,” NASA Administrator Bolden told me in an exclusive one-on-one interview at the MMS cleanroom. Magnetic reconnection is the process whereby magnetic fields around Earth connect and disconnect while explosively releasing vast amounts of energy. The four identical spacecraft – which are still undergoing testing – were stacked in a rarely seen launch arrangement known affectionately as the “IHOP configuration” – because they look rather like a stack of luscious pancakes. “MMS is a fundamental heliophysics science mission,” Craig Tooley told me at the MMS cleanroom. Tooley is MMS project manager at NASA Goddard. “These are called magnetic reconnection events that pump enormous amounts of energy into the plasma and the fields around Earth. It’s one of the main drivers of space weather and a fundamental physical process that is not very well understood,” Tooley explained. MMS will launch atop an Atlas V rocket in March 2015 from Space launch Complex 41, Cape Canaveral Air Force Station, Florida. The vibration testing is a major milestone and is conducted to ensure the spacecraft can withstand the most extreme vibration and dynamic loads they will experience and which occurs during liftoff inside the fairing of the Atlas V booster. MMS is also another highly valuable NASA science mission (along with MAVEN, LADEE and others) which suffered launch delays and increased costs as a result of the US government shutdown last October 2013, Bolden confirmed to Universe Today. “We ended up slipping beyond the original October 2014 date due to the government shutdown and [the team] being out of work for a couple of weeks. MMS is now scheduled to launch in March 2015,” Bolden told me. 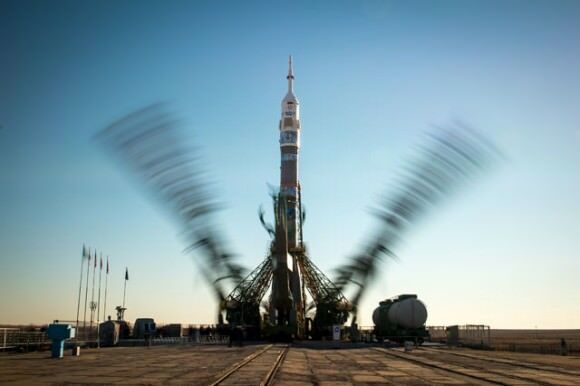 “The downside to slipping that far is that’s its [MMS] costing more to launch,” Bolden stated. Each of the Earth orbiting spacecraft is outfitted with 25 science sensors to study the microphysics of three fundamental plasma processes: magnetic reconnection, energetic particle acceleration, and turbulence. Magnetic reconnection occurs throughout our universe. The spacecraft will use the Earth itself as a laboratory to unlock the mysteries of magnetic reconnection – the primary process that transfers energy from the solar wind into Earth’s magnetosphere and is responsible for geomagnetic storms. The best place to study magnetic reconnection is ‘in situ’ in Earth’s magnetosphere. This will lead to better predictions of space weather phenomena. Stay tuned here for Ken’s continuing MMS, Curiosity, Opportunity, SpaceX, Orbital Sciences, Boeing, Orion, LADEE, MAVEN, MOM, Mars and more planetary and human spaceflight news. It’s been about three months since that infamous meteor broke up over Chelyabinsk, Russia. In that time, there’s been a lot of conversation about how we can better protect ourselves against these space rocks with a potentially fatal (from humanity’s perspective) gravitational attraction to Earth. This week, the European Space Agency officially inaugurated a “NEO Coordination Centre” that is intended to be asteroid warning central in the European Union. It will be the hub for early warnings on near-Earth objects (hence the ‘NEO’ in the name) under ESA’s space situational awareness program. NASA, of course, is also gravely concerned about the threat NEOs present. Its administrator, Charles Bolden, talked about this at a Congressional hearing about asteroids in March. Before delving into the threat, Bolden took a metaphorical deep breath to talk about the dozens of asteroids — a meter or larger — that slam into Earth’s atmosphere each year. Most of them burn up harmlessly, and further, 80 tons of dust-like material rain on Earth daily. A notable meteor that did cause some damage took place about 100 years ago, in 1908, when an object broke up over an isolated area in Russia and flattened trees for miles. Bolden characterized that as a statistically one-in-a-thousand year event, but added that the “real catch” is this type of event could happen at any time. Bolden emphasized that none of the asteroids we have found is on a collision course with the Earth. Still, NASA and other science experts are not complacent. In the same hearing, John Holdren — the president’s assistant on science and technology — recommended following a National Academy of Sciences report to spend upwards of $100 million a year on asteroid detection and characterization. To mitigate the threat, Holdren further recommended a visit to an asteroid by 2025, which would perhaps cost $2 billion.